This wharf is modeled after the granite wharves at which the Charles W. Morgan lay in New Bedford, Massachusetts. The overall dimensions are 150 feet by 100 feet, which means that the Morgan or other large vessels can be moored along any of the three sides. 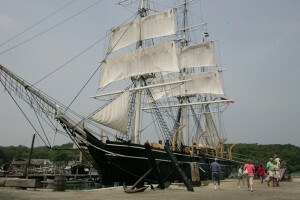 The funds to build this addition to the Mystic Seaport waterfront were given in memory of Hendon Chubb by his family. Chubb was a forceful leader of the insurance managing firm of Chubb and Son of New York. The wharf was built and dedicated in 1974. In the center of the wharf is a representation of an oil pen, where casks of whale oil were stored before processing. At the end of Chubb’s Wharf is a shed that houses the Museum’s Whaleboat Exhibit. Explore our Whaleboat Exhibit, which is displayed in the shed on Chubb’s Wharf.